June 23 is National Pecan Sandy Day. Sandy cookies are as old as the history of baking itself, and pecan sandy is relatively a new invention. Sandy cookies, or sablé cookies, originated in France. This is a shortbread-like butter cookie with texture and color resembling sand. French “sablé” means sand in English, that is why the translated name is often used to describe the dough. Sandy cookies were very popular in France as tea cookies and today they can be found worldwide. 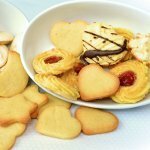 Lemon and chocolate variations of traditional sablé cookies are the most popular. But the Americans invented their own variety of sandy cookies. American dough is a bit lighter than original French shortbread, and chopped pecan nuts are added to cookies. One more variety – a half of pecan nut embellishment is on the top of each cookie. No matter what kind of pecan sandy cookies you will choose, their texture will melt in your mouth. This makes sandy cookies a perfect companion to a cup of tea or coffee. Happy National Pecan Sandy Day!